Suspect wanted for TV theft at James Island office | Crime Stoppers of the Lowcountry: 554-1111 | 1-888-CRIME-SC | Anonymous tips earn cash rewards with Crime Stoppers of the Lowcountry. JAMES ISLAND, SC (WCSC) - Police have released pictures of a man wanted for breaking into the offices of the Riverland Woods Apartments in late March. According to a Charleston Police Department incident report, the man broke into the weight room leading into the main offices at 1001 Riverland Woods Place around 2:50 a.m. on Mar. 30. Surveillance video captures the suspect first attempt to cover cameras with paper towels, before returning to spray paint the lens black. Police say the man stole a 42" TV from the offices. 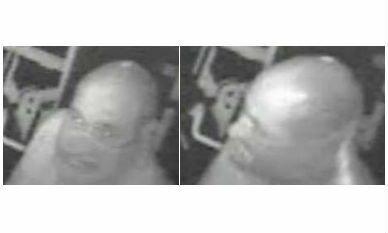 He is described as a bald, heavy-set white male appearing to be in his mid-30s. If you have any information regarding this suspect, call Crime Stoppers at 554-111 or Investigator York at 720-2487.